So, what is the recipe for a happy life? How do we find it? And more importantly, how do we sustain that happiness? 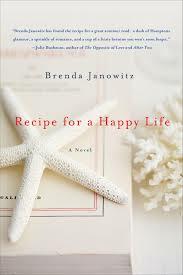 That's the question that propels Brenda Janowitz's glorious new novel, Recipe for a Happy Life. Brenda's the author of Jack with a Twist and Scot on the Rocks, and her work has appeared in the New York Post and Publisher's Weekly. I'm thrilled to be interviewing her here for the blog. Thank you, Brenda! So how do you know what you know about the Hamptons elite? I spent most of my 20s in Hamptons share houses, so I’ve spent a lot of time in the Hamptons, in Southampton particularly. As for the Hamptons elite, I happen to know a lot of fancy people, so I’ve been invited to more than my fair share of grand Hamptons estates. And parties. Lots of Hamptons parties. Can you tell us how your work as a lawyer has informed (or not informed) your life as a writer? Being a novelist takes the same discipline you need to be a lawyer—you have to be able to sit at your computer, by yourself, for hours on end and write. You also have to do a ton of reading. If that’s not law school, I don’t know what is. And that’s the writing life, too. Law is what I know. I guess that’s why I always start with a protagonist who’s a lawyer. For my fourth novel, my editor has made me promise that I won’t make any of the characters lawyers. So, I’ve made my protagonist something I’ve always wanted to be: a magazine editor. What kind of writer are you? Do you have rituals? Do you outline? How do you write? And what was the writing of this particular book like? I’m the sort of writer who just does whatever works. I’ve always written in the spaces between—those quick hours here and there between work, family and life. I wrote my first novel without an outline, I wrote my second one with an outline, and for RECIPE, I did a little of both. At one point, I even had the entire book dissected into scenes on tiny little index cards. I began work on this novel back in 2006, before my first novel was even published. But I don’t think I was ready to write this story just yet. I picked it back up after finishing my second novel, which was published in 2008, and then worked on RECIPE for years. In the time since I began this novel, I met my husband, got married, bought a house, bought a car, and had two children. Shortly after getting my book deal, I lost my Grandma Dorothy, who gave me the initial idea for the book. It’s been years of hard work and I’m so completely thrilled that RECIPE is finally out! What is your personal recipe for a happy life? Or do you think there can be one? I think a lot about this. I often have the discussion with friends: can you choose to be happy? Are some people just happier than others? For me, I think that happiness is a choice. Yes, there are major life events that make choosing happiness impossible at times. When my mother had emergency open heart surgery, there was no happiness to be found until I knew she would be okay. But what I’m talking about is regular day-to-day life. You can either be doing your work, at the supermarket, or picking up your kids with a smile on your face, or you can choose not to make the conscious effort to be happy. When the day gets you down, you can either get angry or laugh it off. For me, the recipe for a happy life would include family and friends. It would also include books and the time to read them. That’s a great question for me—I get obsessed with everything! This summer, I’m completely obsessed with flowers. We have a hydrangea bush out in the front of my house (ah, suburban living! ), and I’ve been cutting the flowers and making arrangements. I read somewhere that cutting the flowers off the bush will make it stronger, so I’ve been researching how to take care of hydrangea. Fascinating stuff. And of course, my newfound love of gardening is creeping its way into my fourth novel. It’s amazing how whatever you’re obsessed with makes it into those pages, isn’t it? These questions have been great! But I’d love to talk about the inspiration for the book. As I said earlier, my Grandma Dorothy gave me the initial idea to write this book. But becoming a mother also inspired me, as did my own mom, who is my best friend. I didn’t realize it at the time, but I wasn’t ready to write a book about the bonds of mothers, grandmothers and daughters until I became a mom myself. Once you become a mother, there are so many things you learn—like the way your mother and your mother’s mother love you. You think you know love, but once you become a mother, you learn that there are different types of love. There are deeper ways to love. I couldn’t write a book about women who loved each other that way until I experienced it myself.